Get ready for an epic post. And 'epic' is the best word I could use to describe my experience in Japan. I knew I was going to love it, but I wasn't prepared for just how much. I've been wanting to visit this magical island ever since I read Memoirs of a Geisha (although perhaps not the best advert for Japan) or watched Sophia Coppola's masterpiece Lost in Translation. I had moments where I was wandering around Tokyo or Kyoto's (guide up next) backstreets in stupefied awe. I think my eyes were as big as the ones on characters in Japanese cartoons. Tokyo is huge, busy, but unlike London or New York, I didn't find it frantic. There's energy, there are lots of people, but it has a calmer air about it, probably because the people are overly respectful, incredibly courteous of others and are generally quiet (there's no symphony of beeping horns like in the streets of London or Paris). And if I looked a little lost in a station for a few minutes, someone immediately came up to me and asked me if I needed help. Japan is also one of the safest places I've travelled in. I'll admit I was a little apprehensive about spending a few days on my own before going to Perrier Jouet's launch of Eden - the event I'd been invited to attend. Would I get lost and get on the wrong train? Truth is, I've never felt so safe! If you want to travel alone, I can't recommend Japan enough. In fact it's equipped for solo travellers. Many of the hotels have single rooms and you won't look out of place eating on your own as many Japanese do this on a daily basis. (It can even be a bonus when you are waiting in line to try a popular restaurant.) The metro is easy to navigate and most people can speak english - if they don't, you can usually get away with some flamboyant hand gesturing. The juxtaposition between the traditional and new is fascinating; I loved the culture, the architecture, the food, the people, the clothes - yes I'm a big Japan convert and cannot wait to go back! I only had six days in total to explore Tokyo, with 24 hours in Kyoto and a night in Hamamatsu to visit an old friend, which definitely wasn't enough to explore the capital let alone much of this fascinating country. Have you been? Scroll down for my Tokyo address book! If you've watched in wonder and awe, Sophia Coppola's debut feature Lost in Translation, starring none other than my favourite dead pan funny man, Bill Murray, then you'll want to stay (or at least grab a drink, dine) at Park Hyatt Tokyo. It's where most of the 2003 film was shot. And here's a little gossip for you: the team requested to stay at the hotel for free, but Hyatt turned them down. Finally the team paid for their own stay (around 3 weeks) and filmed at night so as not to disturb the guests. Ironically the film put the hotel on the map - giving it its biggest amount of free press! The famous scene where Bill meets Scarlet Johansson takes place at the bar in the New York Grill - the hotel's 52nd floor restaurant. Explore Otomesando & Tomigaya neighbourhoods - lots of great cafes, shops etc..
Breakfast at Bread, Espresso & served until 11am, I was too late but ate the best panini I’ve ever tasted and next time I will go back for the French Toast which is served after 3pm..
Dinner at Ichiran – best ramen I’ve eaten that you order from a machine. Perfect for solo dining as they have little cubicles for one. LIFE son - beautiful space that I wanted to go for lunch, but ran out of time..
Eatrip - make sure you book in advance, I tried to get a reservation but it was already booked up..
Mimet – more beautiful ceramics, clothes, linens and baskets. They also have a restaurant downstairs which I will try next time! Fog – I’d been dying to go here, ever since I saw it featured in Kinfolk. 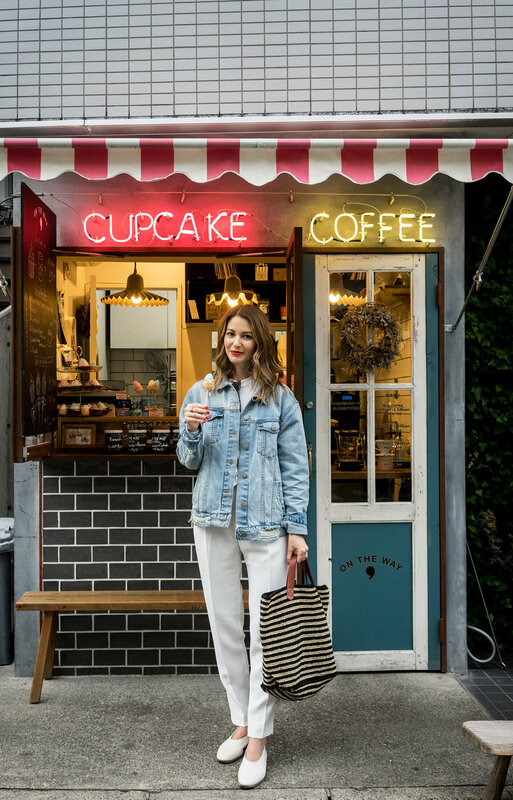 Need Supply - curated collection of clothes from the US, Scandinavia etc..
On the Way – a hole in the wall serving tiny cupcakes on sticks & coffee. More gimmicky than great cake, but perfect photo fodder! Thank you to Perrier Jouet for making my trip to Tokyo possible and to Park Hyatt Tokyo for having me stay.